Our great looking 2018 Ford Focus SE Sedan offers efficiency and looks incredible in Magnetic! With this Front Wheel Drive machine, you will score near 5.9L/100km and enjoy a balanced ride with composed handling. Our SE is sleek and sporty with a black and chrome grille. Everything was designed with the driver in mind with illuminated entry, heated front seats, power accessories, cruise control, a rearview camera, front center storage console and plenty of head and leg room. You'll like that it has ample of cargo space to keep your active lifestyle on the go with you. Maintaining a safe connection is a breeze thanks to the SYNC voice-activated phone and audio interface with an LCD display, Bluetooth, a terrific sound system, available satellite radio, CD/MP3, and two smart charging USB ports. Master each mile with confidence and driving enjoyment with the peace of mind that our Ford Focus has been carefully designed with six standard airbags, electronic stability control, anti-lock brakes, and tire pressure monitoring. Everything you need and want for a stylish, fun, safe and economical ride, our Ford Focus is a fantastic choice! Print this page and call us Now... We Know You Will Enjoy Your Test Drive Towards Ownership! Blackstock is proud to be a premier Ford and Lincoln dealership in the Orangeville, Ontario area. From the moment you walk into our showroom, you'll know our commitment to customer service is second to none. Whether you need to purchase, finance, or service a new or pre-owned Ford or Lincoln, you've come to the right place. 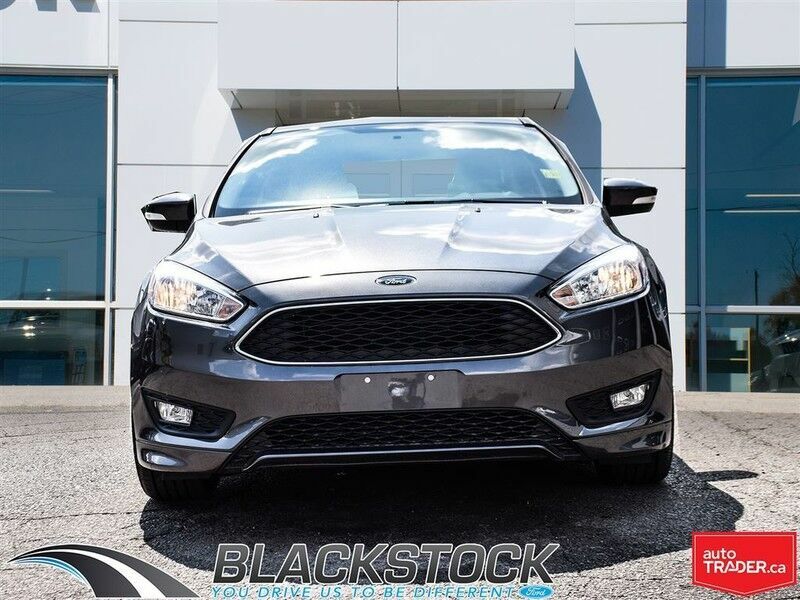 Our great looking 2018 Ford Focus SE Sedan offers efficiency and looks incredible in Shadow Black! With this Front Wheel Drive machine, you will score near 5.9L/100km and enjoy a balanced ride with composed handling. Our SE is sleek and sporty with a black and chrome grille. Everything was designed with the driver in mind with illuminated entry, comfortable heated front seats, power accessories, cruise control, a rearview camera, front center storage console and plenty of head and leg room. You'll like that it has ample cargo space to keep your active lifestyle on the go with you. Maintaining a safe connection is a breeze thanks to the SYNC voice-activated phone and audio interface with an LCD display, Bluetooth, a terrific sound system, available satellite radio, CD/MP3, and two smart charging USB ports. Master each mile with confidence and driving enjoyment with the peace of mind that our Ford Focus has been carefully designed with six standard airbags, electronic stability control, anti-lock brakes, and tire pressure monitoring. Everything you need and want for a stylish, fun, safe and economical ride, our Ford Focus is a fantastic choice! Print this page and call us Now... We Know You Will Enjoy Your Test Drive Towards Ownership! Blackstock is proud to be a premier Ford and Lincoln dealership in the Orangeville, Ontario area. From the moment you walk into our showroom, you'll know our commitment to customer service is second to none. Whether you need to purchase, finance, or service a new or pre-owned Ford or Lincoln, you've come to the right place.